Innovation in music technology doesn’t have to be digital, or even electronic. How many recording sessions have been improved by Rycote’s InVision shockmounts, or the sE Reflexion Filter? 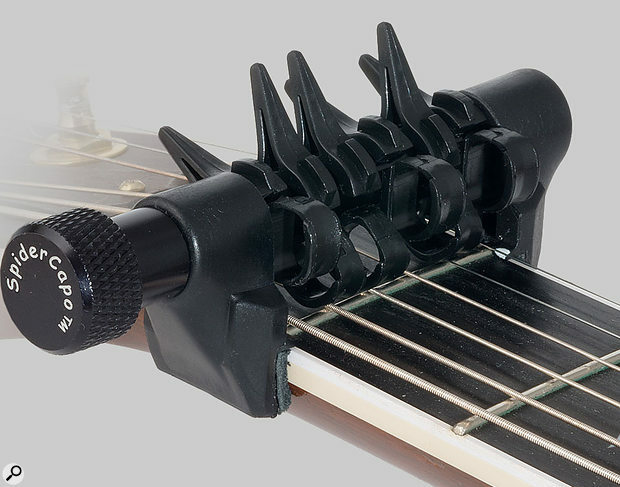 Like those devices, the SpiderCapo is conceptually simple, but was probably more difficult to design than it looks! In essence, it’s a partial guitar capo that lets you choose whether to capo each string. Its makers say that this provides near-instant access to over 900 alternate tunings. A large thumbwheel is used to clamp the SpiderCapo’s plastic end pieces to the top and bottom edges of the fretboard; these end pieces are padded with leather, so you can tighten the capo firmly without risk of damage. Once the capo is in place, you can adjust the position of each string’s individual ‘finger’ to reflect the string spacing at that fret, then engage as many or few ‘finger handles’ as you like, so as to fret only those strings. The further you rotate these handles, the more firmly the string is fretted. This means the SpiderCapo can cope with most fretboard radiuses, but also that you need a light touch to avoid sending strings sharp. With practice, you can apply it reliably and fairly quickly, though I’m not sure I’d want to be doing so on a darkened stage. You can also use the SpiderCapo in conjunction with a conventional capo if you need to. As advertised, the SpiderCapo does indeed make it child’s play to experiment with alternate tunings. Simply by flicking a couple of fingers, you can radically alter the harmonic world of the instrument in ways you’d never bother to try otherwise! At the same time, unlike conventional altered tunings, it does not change the pitch relationship between fretted notes, so an ‘altered’ tuning created using the SpiderCapo feels a lot more familiar than a ‘real’ one. As someone who plays a lot in DADGAD, I found it particularly rewarding in that context, and gravitated most of all to using it at the first or third frets to create odd F, Bb and Eb hybrid tunings. Alternatively, you can use it further up the neck, to fret one or two strings as high-pitched drones, playing with your left hand behind the capo rather than in front of it. There are two obvious limitations on what the SpiderCapo can do. One is that it can only be used at one fret, so you can’t, for instance, use it to simultaneously raise the A string a tone and the G string half a tone. The other is that any strings you leave uncapo’d can’t be manually fretted at the fret where the SpiderCapo is placed. So, for example, although you can theoretically use the SpiderCapo at the second fret to turn DADGAD into a sort of standard tuning, you cut off the all-important second-fret notes on the A, D and G strings in doing so. In general, I think the SpiderCapo will probably have more appeal to fingerstyle acoustic players than to electric guitarists, partly because capos and funky tunings are more widely used in acoustic circles anyway, and partly because it curtails the possibilities of string-bending. For me, though, any restrictions on what you can do with it are trivial compared with the new possibilities it opens up. A few minutes’ experimentation will yield endless inspiration for songwriting, and if you want to come up with fresh accompaniment ideas for existing material, it’s easy to create custom tunings that emphasise significant notes in the right key. 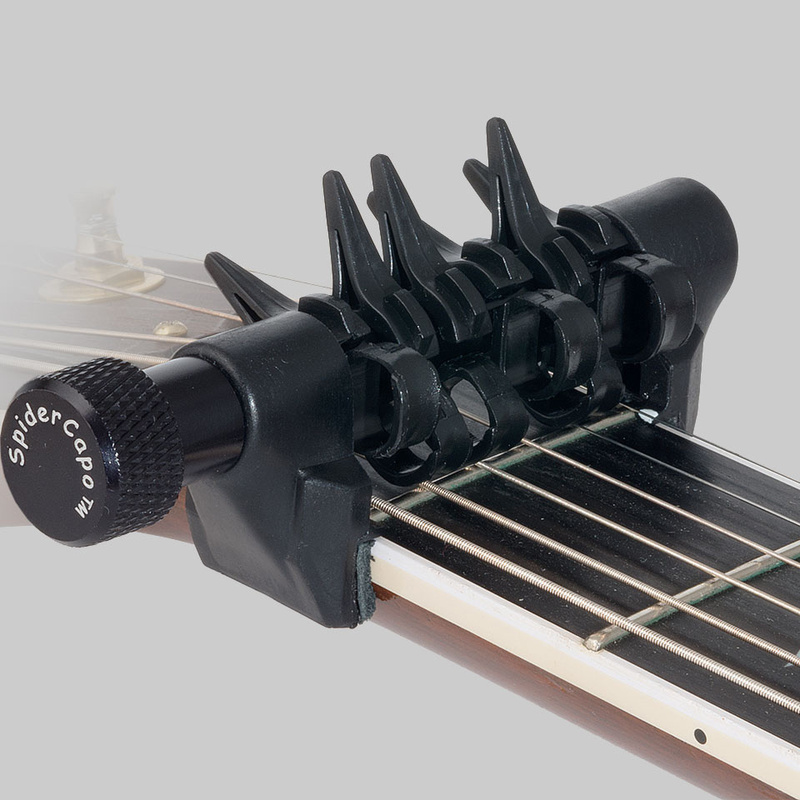 The SpiderCapo is neither digital nor electronic, and compared with most studio gear, its cost is trivial, but its impact on your studio guitar playing could prove revolutionary.